In this context, Drs. 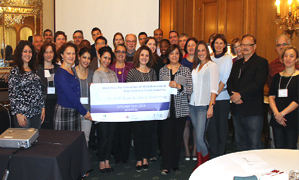 Emami, Tikhonova, and Booij organized and hosted a two-day interdisciplinary workshop in September 2014 on caries disparities, funded through a grant from the Network for Canadian Oral Health Research (NCOHR). Several scientists with expertise in oral health and caries research, clinical psychology, nutrition, social work, health literacy, health policy and health services research, as well as community-oriented and Indigenous community focused research were introduced to community-based oral health and primary care providers, community stakeholders, policy makers, and research scholars. Develop strategic national and international interdisciplinary participatory-action research partnerships in the field of caries disparities, to strengthen research capacity and provide mentored training opportunities for graduate students, postdoctoral fellows, and junior faculty members. Numerous speakers, presentations, and discussion panels helped meeting these objectives, which were divided into 4 themes that reflected the overall interdisciplinary approach of the workshop. Caries is a dynamic and lifelong disease. Although there are large global variations in reporting caries epidemiological data, there is a consensus that caries disease is highly prevalent in vulnerable and marginalized populations. Caries disease results from interactions between biological, behavioural, socio-cultural, and contextual factors that affect people at the individual, community, and population levels. Limited oral health literacy is a significant barrier to appropriate caries management and should be collaboratively addressed. Lower rate of consultation with dental professionals and fewer dental visits because of "non-perceived need" may result in the progression of caries disease. Oral health professionals alone cannot do miracles: families and caregivers should be educated and engaged in dental plaque control and healthy lifestyle habits. One-size-fits-all approaches do not work! Early life stressors such as poverty, divorce, and child abuse can affect physical, mental, and oral health. Neurodevelopmental studies suggest that the interplay between genes and environment may alter brain development, and ultimately general and oral health outcomes. Epigenetic factors may play a role in these processes. Oral health has received a lower priority in public policy compared to general health. It is important to foster collaborations between health professionals, scientists from different disciplines, and stakeholders to address the various dimensions of oral health disparities and inequalities such as illiteracy, jurisdiction, and access to health care at a system level. Historic background and cultural beliefs should be protected and integrated in the design and development of community-based interventions, especially in Indigenous communities. Integration of oral health care in primary care is a crucial step toward an effective heath care system. Oral health primary care will result in improved patient satisfaction and dental public services. It will also better address the needs of marginalized populations in terms of access to dental services. Identify and address common risk factors of oral and systemic diseases by adopting robust research methodologies. Use interdisciplinary approaches and mixed method research in the design of interventions that aim to reduce the rate of caries disease. Prioritize participatory action research to better address the perspectives and needs of communities. Conduct oral health promotion research to provide evidence of the cost-effectiveness of supportive environments. Fill the knowledge gap in oral health primary care through interprofessional education and interdisciplinary research. Dr. Emami is associate professor, faculty of dentistry, University of Montreal, Montreal. Dr. Tikhonova is a postdoctoral fellow, faculty of dentistry, University of Montreal, Montreal. Ms. Loten is an undergraduate student, McGill University, Montreal. Dr. Booij is researcher at Ste-Justine Hospital in Montreal and assistant professor, department of psychology, Queen's University, Kingston. Financial support from the Network for Canadian Oral Health Research and the Quebec Network for Oral Health and Bone Research is gratefully acknowledged. We would like also to acknowledge all speakers and workshop participants as well as the students for their active participation and contributions to the workshop. Special thanks to Elmira Ismaylova, Daiane Cerutti, Faheem Khiyani and Nastaran Sharifian for their help and efforts during this workshop. Marcenes W et al. Global Burden of Oral Conditions in 1990-2010: A Systematic Analysis. J Dent Res. 2013 Jul;92(7):592-597. Kassebaum NJ et al. Global Burden of Untreated Caries: A Systematic Review and Metaregression. J Dent Res. 2015 May;94(5):650-658. Government of Canada. Statistics Canada. Canadian Health Measures Survey (CHMS). 2010 (accessed April 2015). Available at: www23.statcan.gc.ca/imdb/p2SV.pl?Function=getSurvey&SDDS=5071. Gouvernement du Québec. Ministère de la Santé et des Services sociaux. Étude 1998-1999 sur la santé buccodentaire des élèves québécois de 5-6 ans et de 7-8 ans. 2010 (accessed April 2015). Harris R et al. Risk Factors for Dental Caries in Young Children: A Systematic Review of the Literature. Community Dent Health. 2004 Mar;21(1 Suppl):71-85. Irvine J et al. Early Childhood Caries in Indigenous Communities: A Joint Statement with the American Academy of Pediatrics. Paediatr Child Health. 2011 Jun;16(6): 351-364. Harrison R. Oral health promotion for high-risk children: case studies from British Columbia. J Can Dent Assoc. 2003 May;69(5):292-296.